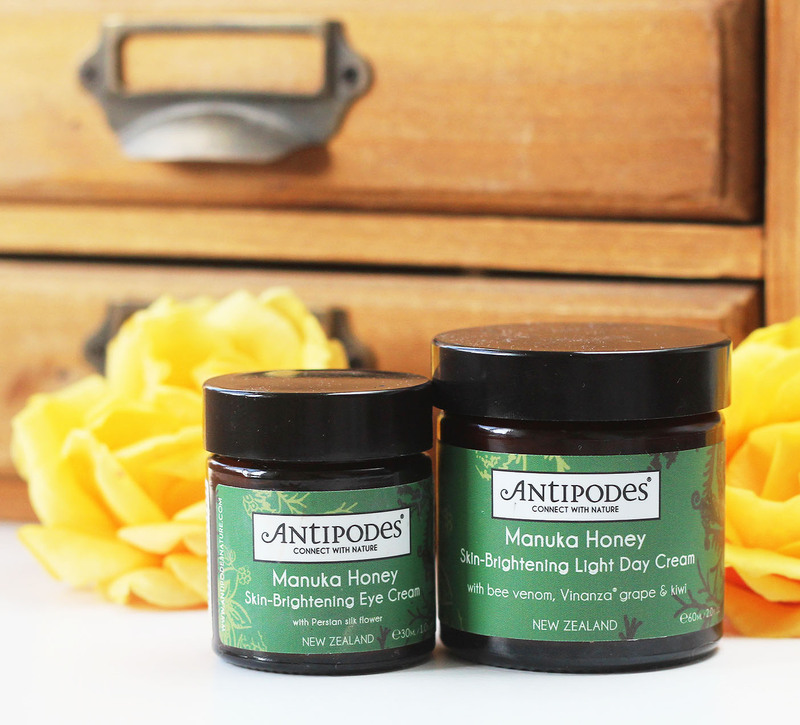 The past few weeks I've been trialling the Antipodes Manuka Honey Brightening Day Cream* & Eye Cream*, and I'm ready to share my thoughts. First of all I do want to add a quick disclaimer that I'm very aware that these products look untouched. They had been in my make up bag because I'd stayed at my boyfriends overnight, they'd been upside down so all the product had rushed to the lid. Hence why jars look so full! Before I even get onto the actual review, I've got to say that I love the packaging. They feel so sturdy and substantial and the jars are almost apothecary-like. 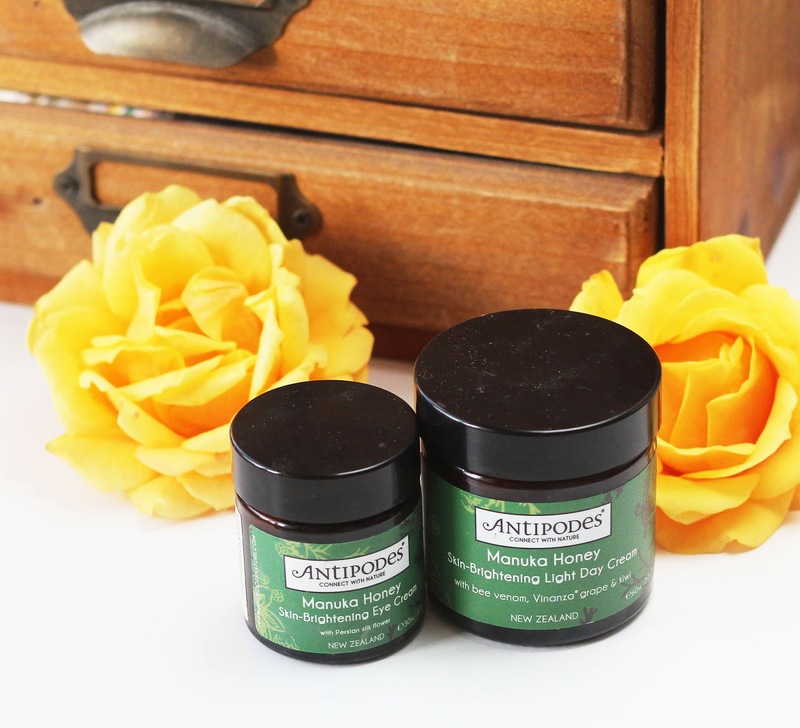 I love the whole feel of them, and Antipodes's aesthetic as a brand. Aqua (Water), Persea Gratissima (Avocado) Oil, Cetearyl Olivate, Sorbitan Olivate, Olea Europea (Olive) Seed Oil, Hydrogenated Vegetable Oil, Propanediol, Acetyl Hexapeptide Í 3, Leptospermum Mel (Manuka Honey) Extract, Glycerin, Cyathea Cumingii (Mamaku Black Fern) Leaf Extract, Betaine, Stearic Acid, Butylene Glycol, Arbutin, Citric Acid, Sodium Sulfite, Acetyl Tyrosine, Saxifaga Sarmentosa (Strawberry Begonia) Extract, Paeonia Suffruticosa (Peony) Extract, Aminopropyl Ascorbyl Phosphate, Scutellaria Baicalensis (Skullcap) Root Extract, Glutathione, Lactoperoxidase & Glucose Oxidase, Isoamyl Laurate, Galactoarabinan, Carrageenan Gum, Tapioca Starch, Salvia Hispanica (Chia) Seed Oil, Actinida Chinensis (Kiwifruit) Seed Oil, Sodium Phytate, Alcohol, Bisabolol, Sodium Citrate, Hyaluronic Acid (Plant Derived), Helianthus Annuus (Sunflower) Seed Oil, Rosmarinus Officinalis (Rosemary) Leaf Extract, Vitis Vinifera (Vinanza© Grape) Seed Extract, Vitis Vinifera (Grape) Seed Extract & Actinidia Deliciosa (Kiwifruit) Extract (Vinanza© Performance Plus), Apitoxin (Bee Venom) Powder, Fragrance Of Honey: Benzyl Alcohol, Benzyl Benzoate, Benzyl Cinnamate, Cinnamyl Alcohol, Coumarin, Farnesol, Geraniol, Isoeugenol, D-Limonene, Linalool. "..massages into the epidermis for an instantly more youthful appearance. 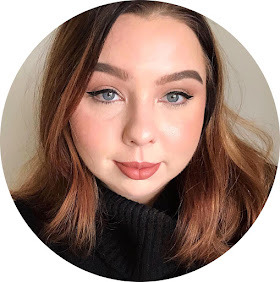 Bolstered with an array of natural enhancements the rich formula works to reduce blemishes, even the skin tone and offer an intense hit of moisture for skin that appears brighter from the first application." My first impression of this moisturiser is the smell. Wow, it's so good! It smells like sweet, melted chocolate. The texture is very thick, but it massages very well into the skin. And a little goes a very long way. 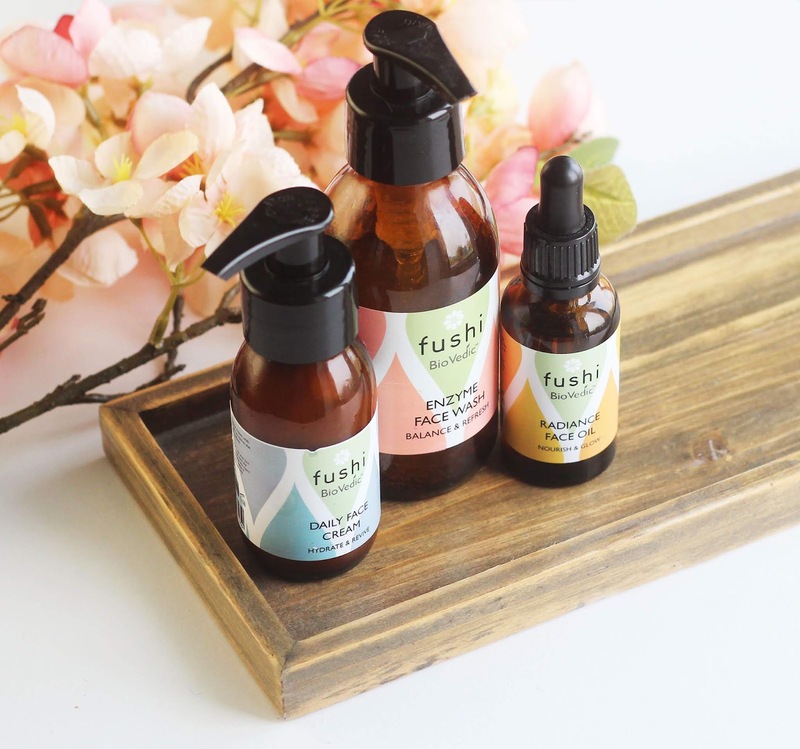 It's intensely hydrating and it feels especially soothing on dry, flaking skin, thanks to containing (plant derived) hyaluronic acid, a hero ingredient for dry skin. This is the moisturiser I always reach for when my skin is feeling especially parched. It does brighten the complexion and even out skin tone, but Ive also noticed my skin is dramatically softer. Like, really soft. I love the feel of this moisturiser and how it makes my skin feel! I really recommend it, particularly if you're looking for hydration. Aqua (Water), Cetearyl Olivate, Sorbitan Olivate, Persea Gratissima (Avocado) Oil, Leptospermum Mel (Manuka Honey) Extract, Glycerin, Aqua, Sodium Levulinate, Sodium Anisate, Theobroma Grandiflorum (Cupuacu) Butter, Stearic Acid, Betaine, Glycerine, Jojoba Esters, Glyceryl Stearate Citrate, Glycerin & Albizia Julibrissin (Persian Silk) Bark Extract & Darutoside, Simmondsia Chinensis (Jojoba) Oil, Cetyl Alcohol, Glyceryl Caprylate, Actinida Chinensis (Kiwi) Fruit Seed Oil, Retinol (Vitamin A) & Caprylic/Capric Triglyceride, Tapioca Starch, Tocopherol (Vitamin E), Galactoarabinan, Glycerin, Cyathea Cumingii (Mamaku) Leaf Extract, Vitis Vinifera (Vinanza© Grape) Seed Extract, Actinidia Deliciosa (Vinanza© Kiwi) Extract, Sodium Phytate, Alcohol, Dehydroxanthan Gum, Daucus Carota (Carrot) Seed Oil, Sodium Citrate, Helianthus Annuus (Sunflower) Seed Oil, Rosmarinus Officinalis (Rosemary) Leaf Extract, Essential Oil Fragrance Of Honey: Benzyl Alcohol, Benzyl Benzoate, Benzyl Cinnamate, Cinnamyl Alcohol, Coumarin, Farnesol, Geraniol, Isoeugenol, D-Limonene, Linalool. 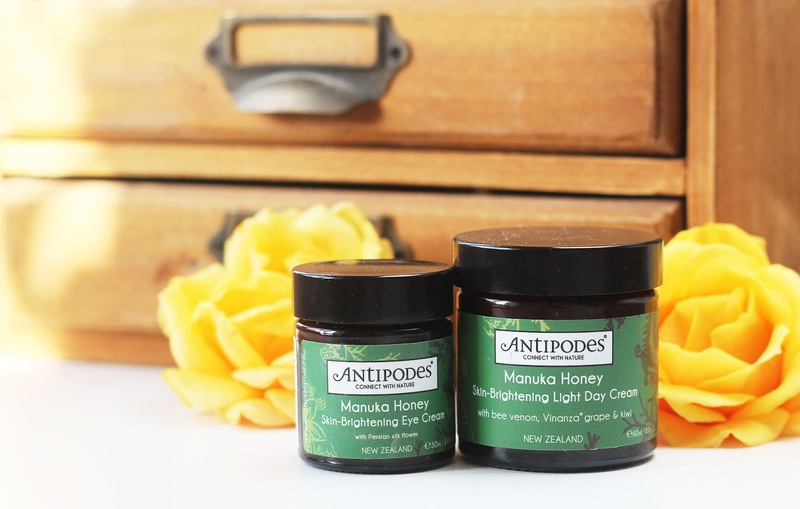 "the Manuka Honey Skin Brightening Eye Cream works to plump and moisturise the eye cream for rest, awakened appearance. The fast absorbing cream aims to penetrate the delicate skin in order to brighten darkened areas as well as imparting anti-inflammatory benefits for a youthful, rejuvenating finish". This eye cream is excellent at soothing a sore under eye area. 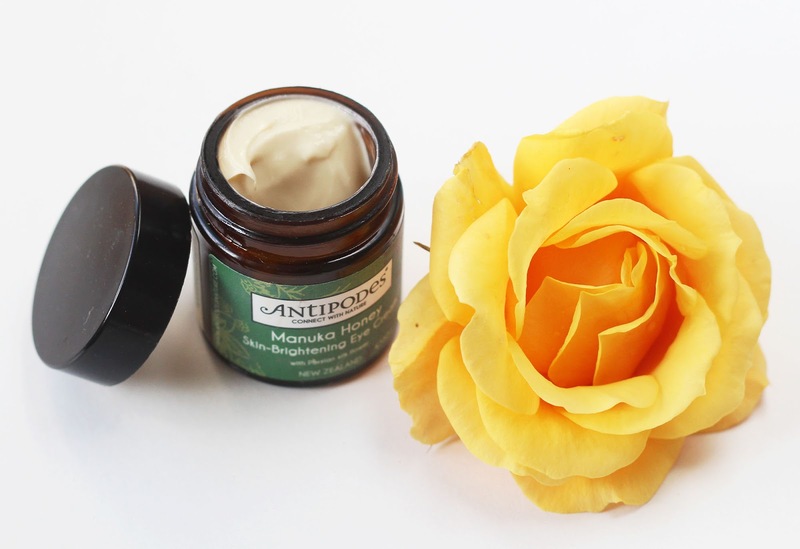 It has a lovely cooling effect, as well as helps to erase dark circles. It instantly relieves dark circles and sagginess. I adore how hydrating and luxurious it feels. 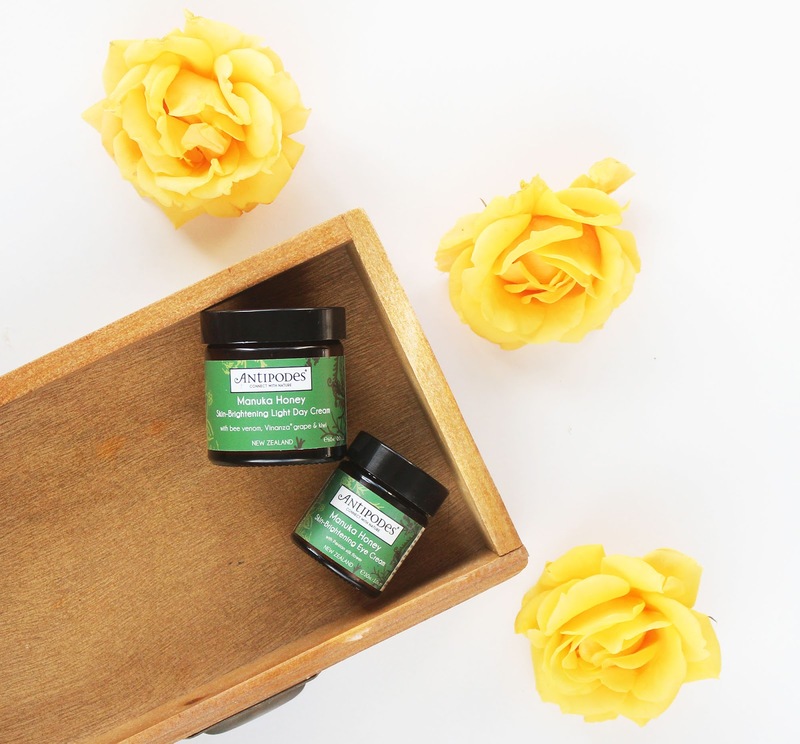 It helps to depuff and nourish the ever-so-delicate under eye area. It does take a little work to blend it in, but that doesn't necessarily need to be a negative. Massaging the under eye area is a good thing, after all! Overall I'm really glad I got this eye cream, it's totally replaced my previous holy grail (Clinique's Puff Off). Plus, you get a hefty 30ml (for comparison in Clinique's Puff Off is 10ml) which is a lot of product for an eye cream, at £36 I'd say this is pretty good value. 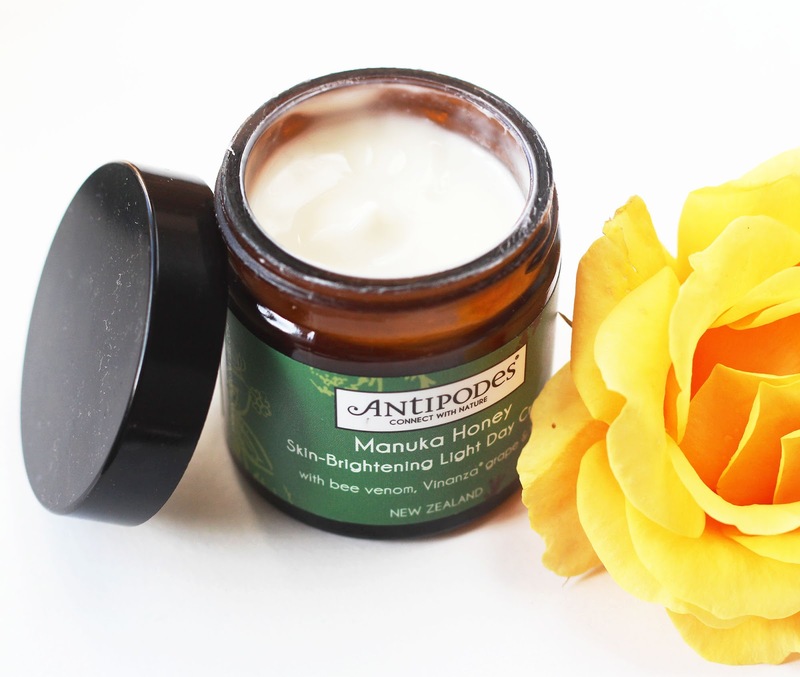 What are your Antipodes favourites? Product descriptions and ingredients lists sourced from BeautyBay.com.